There are some key factors separating true white from grey, perlino or cremello. Greys are usually born dark, and lighten, but occasionally they are already light grey at birth. They are recognized by the dark skin under the grey coat. The Grade I winner Hansen is a perfect example of a grey that was born nearly white. A single cream gene turns bay to buckskin and chestnut to Palomino, and two copies cause further colour dilution to perlino and cremello, which are shades of ivory. These horses have pink skin and always have blue eyes. But true white is different. Most true whites are either extreme overo or extreme sabino pintos with much or all of the colour gone from the coat. Wherever the hair is white, the skin is pink. Overo is uncommon in Thoroughbreds. Even the most extreme overos usually have some colour on the head. If the horse is not a cream dilute, but it has blue eyes, it's an overo or an overo/sabino combination. 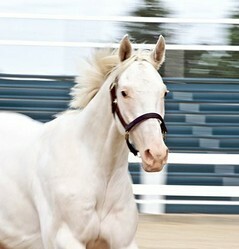 The most common white in Thoroughbreds is sabino. One copy of the sabino gene can cause just a little white, a white stocking, a blaze, or even white spots coming up from the belly. Certain signs of sabino are high stockings, socks with jagged edges with a "point" of white pointing upward and white on the chin. Two copies of the sabino gene results in a horse with a lot of extra white, sometimes even completely white. Sabinos always have dark eyes unless they also carry cream or overo — some horses have both pinto genes. But there is a fourth kind of white in Thoroughbreds. It is called Dominant White (DW) because its presence always shows itself. If the gene is there, the horse's coat will always be at least 50 per cent white. Dominant White Thoroughbreds range in colour from having white legs and large white patches on the body, often with a lot of roaning and freckling, to being completely white. Some have mottled skin under the white hair. Unless overo and/or a dilution gene is also present, the eyes will be dark. Dominant White is now understood to be a mutation of the sabino gene. Because every Dominant White horse has only one copy of the gene, only about 25 per cent of its offspring are likely to be Dominant White. It is believed that embryos with two copies of the DW gene die early in the mare's pregnancy and are resorbed, as occurs in other species with comparable Dominant White genes. Dominant White always surfaces as a specific mutation in a single horse, who then passes it on. Overall, eleven separate Dominant White genetic mutations have been detected in horses. Of these, four have been identified in Thoroughbreds. Interestingly, all of the known bloodlines of both DW and extreme sabino Thoroughbreds originate from racing families as opposed to sport horse (non-racing) bloodlines, unlike the overo pinto and dilute colours, which are found mostly amongst the sport horse Thoroughbred bloodlines. There is no way to tell whether a horse is DW or extreme sabino just by looking at it. Only genetic testing can determine for sure whether a white or mostly white Thoroughbred with pink skin and dark eyes is sabino or DW, but a high percentage of white offspring from a white horse generally suggests it is more likely to be extreme sabino. Sometimes these horses are registered as roan, grey, “grey or roan” or by their base colour (for example, a white with chestnut ears may be called chestnut), making research into the actual numbers of white offspring difficult. The most famous of the white Thoroughbred families is the Patchen Wilkes Farm line of horses, all descending from a white filly named White Beauty born in 1963 in Lexington, Kentucky. By Ky Colonel out of Filly O'Mine, by Holdall, she caused a huge stir when she was born. She founded an entire line of white and nearly white Thoroughbreds, although it really began with her sire, a chestnut with extensive white markings who was actually the first DW in this bloodline. He sired another DW named War Colors who died at age 5, leaving White Beauty as the only one to carry on the white bloodline. The mutation in this family is designated W2. White Beauty made 16 starts with two wins and a third. She had six foals. Beauty N Motion (unraced), a white by the grey Spotted Line, produced one foal, the unraced white stallion War Painting, by Whitesburg, and he left no progeny. Busy Fellow (one start, unplaced), a stallion by Sir Ribot, was registered as a roan but was actually a coloured DW, but he was not bred from. White Beauty's best foal was stakes-placed Vennie Redberry (69-7-11-14, over $115,000 earned), but he was a grey, not white. White Beauty's 1972 foal, World O'Beauty (7-2-1-2), was a white mare (registered as roan) by the Turn-To son Reverse. World O'Beauty was the only one to carry the DW gene from her mother into future generations. She had seven foals, two of which were white: Late N White and Precious Beauty. Again, only Precious Beauty (1981, by Jantullah) carried the line forward. Although unraced, she had eight foals, three of which raced with very limited success. Two of her foals were white, but one had to be put down as a foal after being kicked by another mare, leaving just Patchen Beauty to carry on with the DW gene. Patchen Beauty, foaled in 1995, was by Hatchet Man, a well-bred grey sabino son of The Axe II. She made 23 starts with a record of 2-2-2, earning $54,268. Her seven offspring were all bred to run, and going against the odds, five carried the DW gene: three by Pioneering, one by Skip Away and one by Devil His Due. Her 2011 filly is registered as a grey/roan. All her foals of racing age earned some money on the track. The most successful was the white Patchen Prince (2005) whose record was 13-2-2-2 and winnings of just under $48,000. Another Patchen Beauty son, The White Fox (pictured at top as a foal), had one win in eight starts. He died young, leaving just 10 offspring foaled between 2008 and 2010, but all except two are registered as white. Patchen Beauty's daughter Spot of Beauty had a white foal in 2009 by WhyWhyWhy and another white foal in 2011 by Devil His Due. Spot of Beauty's 2013 foal by Thunder Gulch is a big white colt with chestnut spots. Despite a shaky start, it appears this line of Dominant Whites now has enough members to continue on. The bay pinto Puchilingui, by Native Royalty—Carolinaway, by Needles, was foaled in Florida in 1984. He was thought to be an extreme sabino with a lot of roaning, but he was DNA tested as Dominant White. This line has produced both pure white and pinto Dominant Whites. This mutation was designated as W5. Puchilingui made six starts and had a single win. He sired 36 registered foals. Fourteen are registered as white. His Palomino pinto son Sato appears sabino, but was genetically tested as DW. At least four more appear to be sabino, but without genetic testing, there is no way to be certain which colour they are. Only a few raced, none successfully, despite some excellent bloodlines. Many of Puchilingui's offspring, including Sato, are being used in colored warmblood breeding programs where they have been quite successful, instead of being bred for the track. Sato has sired several white Thoroughbreds, some carrying the DW gene and some extreme sabino. As of 2013, the names of the other two Dominant White bloodlines carrying the W6 and W7 mutations have not been published. Another line, while not DNA tested, is believed to be carrying DW as well, but could be maximum sabino. The first of the line is a mare named Not Quite White, who was all white with chestnut on her ears, mane and tail. Foaled in 1989, she is by the sabino Northjet, a champion miler in France, out of Sad Song, by Roberto. All her foals were by Naevus, a minimal overo and/or sabino with a white spot on his side. Naevus was known as a sire of both stakes winners and coloured Thoroughbreds. Not Quite White's first foal was Spotted Lady, registered as chestnut. The second was Airdrie Apache, so named because he looked like an Indian pony when he was born at the famous Airdrie Stud in Kentucky. Airdrie Apache, born in 1993, was unraced and is a sire of sport horses, although some of his white offspring made a few starts. Finally, there is the mostly white mare Turf Club, by Trust N Luck—Deebrand, by Gone West. Foaled in 2005, this filly was born white with chestnut spots and a chestnut mane and tail, but it is unknown if she is DW or sabino. She raced six times, but failed to break her maiden. On March 27, 2013, Turf Club foaled a white filly sired by Old Fashioned, a grey sabino by Unbridled's Song—Collect Call, by Meadowlake. With sabino on both sides of the pedigree, only DNA testing can determine whether Turf Club's new white foal is extreme sabino or Dominant White. Turf Club is a half-sister to Adorable, a confirmed sabino with white stockings and spots, who won twice and earned more than $20,000 in 12 starts. Adorable has produced two white Thoroughbred foals by the DW stallion Sato. Both foals were DNA tested. Her 2006 colt, BCF Sand Castle, is extreme sabino and the other, BCF Headliner (2009), is Dominant White, emphasizing how two horses that look the same and with the same parents can be different in terms of the genes responsible for their colour. While all of the above horses were North American, white Thoroughbreds are found elsewhere, too. Racing and produce records, and especially colours of offspring, are sometimes hard to find, since these horses come from different registries and sometimes are registered in another language. The pure white colt Mont Blanc II, by Murghab out of Tharsine, was born in France the same year as White Beauty. His foals were registered as several breeds: Thoroughbred, Selle Francais, Ango-Arab and Trotter. He reportedly sired nine registered whites. His white Thoroughbred daughter Blanche Fleur produced several white or mostly white foals. It is unknown if this white line is sabino or Dominant White, but the description of some of his offspring as being marked like Clydesdales suggests sabino. In Australia, the unraced colt High Rail Curious (foaled in 2004, by Highrail Danehill) carries both sabino from the sire's side (inbred to Northern Dancer) and what appears to be DW from his white dam, Like A Gambler, who in turn was sired by the speckled white stallion Colourful Gambler. Colourful Gambler got his colour from his sire, Khaleben (registered as white-bay), whose dam, Glacial (1966, by Grey Marwin—Milady Fair), was all white with chestnut in her mane and tail. Glacial's dam, Milady Fair (1960, by Jambo—Silver Gown, by Pageant), was described as bay sabino and produced another white Thoroughbred named Miasmic in 1971, proving that this line of whites began with her. Again, without DNA testing, there is no way to be sure if these horses are DW or extreme sabino, or even some of each. 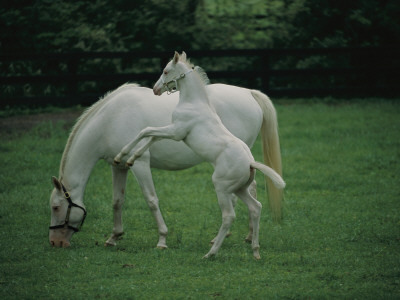 Another white filly that raced in Australia was The Bride, foaled in 1991, by Star Shower—Salomeneo, by Idomeneo. She produced one white and one grey Thoroughbred foal, but it is unknown whether she was DW or maximum sabino. Her white son, Spooky, died at age 4, and progeny records are not shown for the grey daughter, so this line may have ended. A white New Zealand-bred filly named The Opera House sold for $270,000 at the Magic Millions yearling sale in Australia in 2009. By Zabeel—Carmina Burana, by Star Way, she won one and placed five times in eight starts. She and the winning 2002 white filly Legally White, sired by Zabeel's son, I Conquer, out of Matilda, by Hermod, probably are both extreme sabino, but DW cannot be ruled out without testing. Haku Taiyu was the first white Thoroughbred born in Japan. Foaled in 1979, by Long Ace—Homare Bull, by Double Mark, he made four starts but failed to place. He has sired at least five white foals, one out of the 1983 Japanese-bred white mare Kamino White. Shirayukihime, a white Japanese mare born in 1996 from solid-coloured parents (her sire was the great Sunday Silence) has produced seven white foals and one grey between 2003 and 2011. Two have blue eyes or partly-blue eyes, suggesting that overo is present, although sabino is there, too, through the Northern Dancer—Halo “nick” that has produced many brightly-marked sabinos. Her pure white daughter Yukichan is a stakes winner in Japan, making this the most successful of the white bloodlines anywhere. Based on the high percentage of whites being produced, this is not Dominant White, but a combination of overo and sabino. With such excellent pedigrees, this could be the start of a line of successful white and pinto race horses. In the British Isles, there reportedly have been as many as 30 whites born, but what type of white they are is unknown. The White Admiral, registered as white, is another Northern Dancer descendent, being by the multiple Group 1 winner Revoque and out of Stage Debut, by Decent Fellow. This gelding was born in Ireland in 2005 and raced over hurdles, managing a couple of thirds. In September 2011, a white colt with chestnut ears was born in South Africa. Named Gran Blanco, the colt is by graded stakes winner Kahal (a Northern Dancer descendant) out of Perakeen, by Rakeen (by Northern Dancer). His sire and dam have almost no white, so he could be another DW mutation. There are, of course, numerous other white or mostly white Thoroughbreds, but not all make it to the track or produce offspring that race. Because of their colour, they are often found being used to produce exotic sport horses. Despite the relative few Dominant Whites, with the maximum sabinos added to the mix, the time will come when it is not such a big surprise when a white or wildly spotted Thoroughbred sets foot on a race track. Want to learn more about Thoroughbreds and colour genetics? Here are some book you might like.